Most of the 160-member Pro-Life Club of Bishop Shanahan High School prepare to depart their school in Downingtown for the annual March for Life Jan. 18 in Washington, D.C. The archdiocesan Catholic school was named National High School of the Year by Students for Life of America. 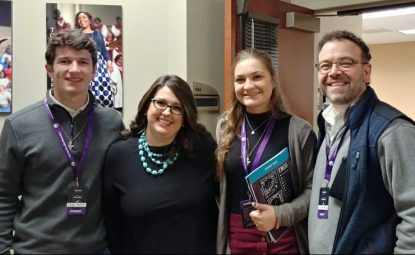 Many good things happened in Washington, D.C., surrounding the Jan. 18 March for Life, although mainstream media focused on an incident where a group of kids from Covington, Kentucky were thrown under the bus. A local positive example happened the next day when the students from Bishop Shanahan High School in Downingtown accepted the National High School of the Year award from Students for Life of America (SFLA). That’s quite an honor considering SFLA has more than 1,200 high school and college chapters nationwide. Along with the award the Shanahan SFLA group received $1,000 to assist it in its mission. Probably no one knows that better than Joe Aquilante, a theology teacher at Shanahan for 21 years and moderator of the school’s pro-life group for the past 18 years. At this time there are about 160 students in the SFLA Chapter. Bishop Shanahan theology teacher and Pro-Life Club moderator Joe Aquilante, right, shares a moment with students Michael Prieto (left) and Mary Taylor (third from left) during a Jan. 19 conference with Students for Life of America, which named Shanahan National High School of the Year for its pro-life efforts. Mary Taylor, a senior and president of SFLA at Shanahan, is only in her second year at the school. “I’ve always been pro-life,” she said, adding at her previous public high school she was in the minority but that is not the case at Shanahan. “I was raised Catholic and know killing anyone is wrong,” she said. Over the years she has heard about girls getting an abortion but never really personally knew one who did. Mary personally believes it is her generation that will end abortion or at least overturn Roe v. Wade as national law and return it to the states, and the more permissive laws passed in New York and proposed elsewhere are a sign others believe this too. The strength of the pro-life movement at Shanahan was really exhibited during the March for Life. Michael Prieto, also a senior, is vice president of SFLA at Shanahan and has been a member since his freshman year. Even outside of the school Michael has not experienced much opposition, other than counter protestors at times when members give witness outside abortion clinics. At this time all of the archdiocesan high schools have SFLA groups. Others that sent delegates to the meeting in Maryland include John W. Hallahan, West Catholic Prep, St. Hubert and Cardinal O’Hara. 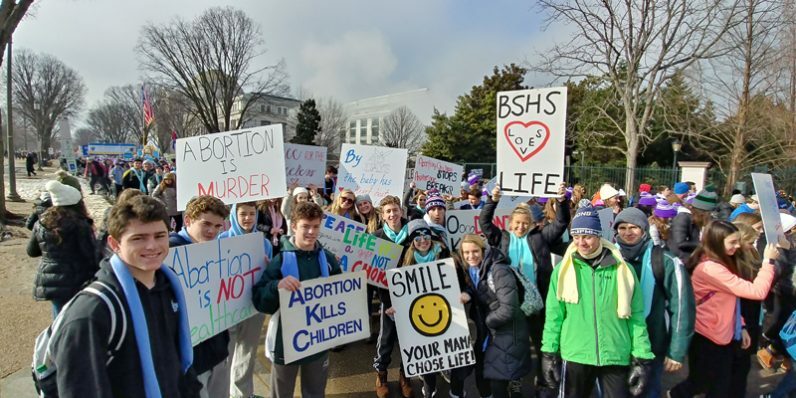 The Bishop Shanahan High School contingent shows their enthusiasm on the streets of Washington, D.C., at the Jan. 18 March for Life. Im from a big family and were all pro life. Its great to see that there are more of us out there. The amount of people that were at the March was awesome. Keep up the good work.